Click Switch audio to my phone in the business bar, click Connect, and then note the number and conference ID to call in to the meeting. Click More options > Change Audio Connection, and then click Connect. Note the number and conference ID, and call in to the meeting. Save your Skype Meetings App settings at the end of the meeting by clicking Yes when you see Save Your Name and Settings. In the Skype for Business Web App meeting window, go to More options > Meeting options. On the General tab, make sure the Remember me on this computer box is checked. 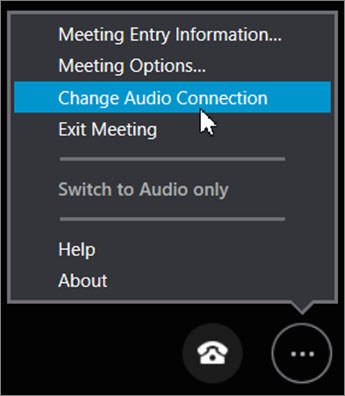 On the Phones tab, select Prompt me before joining to confirm or select another audio source, and then select OK.
Exit the meeting temporarily by going to More options > Exit meeting > OK. Select Rejoin in the browser window. Important: The Have the meeting call me and I will dial in to the meeting options are available only if the organizer's Skype for Business account supports it. Check your meeting request for dial-in information, or contact the organizer if you're not sure. Choose Join meeting audio and video from my computer, and then select Join. Choose Have the meeting call me, enter your country code and phone number, and then select Call Me. Choose I will dial in to the meeting and connect to meeting audio using the phone number and conference code shown.